Home » Blog » Averages Concepts from Arithmetic – How to apply in CAT Questions? 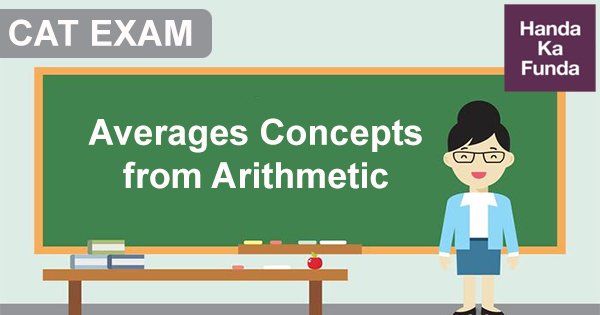 Averages Concepts from Arithmetic – How to apply in CAT Questions? Average is mainly defined as the sum of observations divided by the number of observations. Keeping in view the Quantitative Aptitude section of any competitive exam and especially CAT, 1-2 questions are asked from this chapter. It is not a difficulty chapter if you know the tricks to solve the question in very less time. When the number of terms is odd – the average will be the middle term. When number of terms is even – the average will be the average of two middle terms. To understand the concept properly, let’s try doing some questions. Example 1: The average weight of a class of 24 students is 36 years. When the weight of the teacher is also included, the average weight increases by 1kg. What is the weight of the teacher? Example 2: Find the average of first 30 natural numbers. Example 3: A man buys spirit at Rs. 60 per liter, adds water to it and then sells at Rs. 75 per liter. What is the ratio of spirit to water if his profit in the deal is 37.5% ? This should be actually the weighted average of the costs of spirit and water. Now, Cost of water is 0. Example 4: Shyam went from Delhi to Shimla via Chandigarh by car. The distance from Delhi to Chandigarh is ¾ times the distance from Chandigarh to Shimla. The average speed from Delhi to Chandigarh was again half as much as from Chandigarh to Shimla. If the average sped for the entire journey was 49 kmph, what was the average speed from Chandigarh to Shimla? Also, the ratio of the speeds between (Delhi-Chandigarh): (Chandigarh-Shimla) = 3:2. Let the distances be 3x and 4x respectively and speeds be 3s and 2s. Example 5: A car rental agency has the following terms. If a car is rented for 5 hr. or less, then the charge is Rs. 60 per hour or Rs. 12 per kilometer whichever is more. On the other hand, if the car is rented for more than 5 hr., the charge is Rs. 50 per hour or Rs. 7.50 per kilometer whichever is more. Akil rented a car from this agency, drove it for 30 km and ended up paying Rs. 300. For how many hours, did he rent the car? Solution: We can solve this question by using trial and error method. Scenario 1: Let us consider that Akil rented the car for 5 hr. or less. Here, 12 * 30 = 360 > 300. So if Akil would have taken the car for 5 hours or less, he would have paid 360 for sure. But he has paid only Rs. 300. So, he has not taken the car for 5 hours or less. Scenario 2: Let us consider that Akil rented the car for more than 5 hours. But, Akil has paid INR 300, which means payment was done on per hour basis. Thus, Number of hours for which Akil rented the car would be = Rs. 300 / Rs. 50 per hour = 6 hours. Average of first seven integers = 4. Here, the average will be the middle term i.e. a+2. It is given that a+2= n.
Now, similarly, a set of 7 integers can be expressed as a, a+1, a+2, a+3, a+4, a+5, a+6. In this set, the average will be the middle term i.e. a+3. The term a+3 can be written as; a+2+1. So, the answer is option (b). Example 7: A train traveling at 72 kmph crosses a platform in 30 seconds and a man standing on the platform in 18 seconds. What is the length of the platform in meters? Therefore, length of the platform = 20 * 12 = 240 meters. Conclusion: The concept of averages has various applications while solving different quantitative aptitude question. Some of the important application is mentioned above along with examples. Concept of average is often combined with various other concepts such as age, speed and distance, natural numbers etc. If we know the basics and have solved some of the CAT questions on these topics, it is not difficult to solve average related problems.